This description details the structure at the start of a hard disk in a PC, and how GRUB fits into that structure. The diagram below is the disk layout of my linux laptop which is very standard. 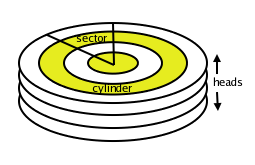 There are 4 primary partitions whose size and function are labeled, but this document is going to concentrate on the expanded area in the diagram at the start of the disk. I will describe its structure and how GRUB fits in. Note the structure is the same for windows systems, only the content (grub) is different. Note there is no mystery about or dissassembly required of the blue section above as GRUB is open source and one can download, inspect and modify its stage 1 source code. DOS had the requirement that its image did not span across cylinders, and so this region was added by partition managers so that the first partition was aligned on a cylinder boundary. Therefore this region's size is determined by the number of sectors (512 bytes) per cylinder. The maximum (and usual given todays disk sizes and LBA) sectors per track is 63, which leaves 62 sectors free after the MBR (31,744 bytes). Note be very sure you know what your doing before running these commands. Note also the official grub docs on these disk areas which appeared about 7 years after I wrote the notes above. BIOS code reads MBR from a disk (looks at last 2 bytes to verify if MBR). Starts executing bootloader code (GRUB stage 1). Bootloader jumps to location (sector num) of next stage. This sector num is stored at a particular location in the bootloader "code" at GRUB install time and usually points to a stage 1.5 located in the "DOS compat space" immediately after the MBR. Stage 1.5 knows about the boot file system so it opens the file system on the specified (at install time) partition. It looks for the stage 2 executable here and executes it. Note since stage 1.5 knows about the boot file system it gives much greater flexibility in upgrading stage 2 and the kernel etc. as their new locations don't need to be written to the earlier GRUB stages. Stage 2 contains most of the GRUB logic. It loads the menu.lst file and executes the statements, usually providing a menu to the user etc. When GRUB starts booting one of the entries, it reads the initial ramdisk and starts the kernel running telling it about the ramdisk. In the initial ramdisk, the nash shell is run to parse the /linuxrc file. It essentially finds the location of the file system it itself is on and passes that to the kernel as its root (/) file system. This allows for greater flexibility of the devices the kernel resides on. These scripts start various subsystems, culminating in starting X. X in turn starts the display manager which gives a login prompt. 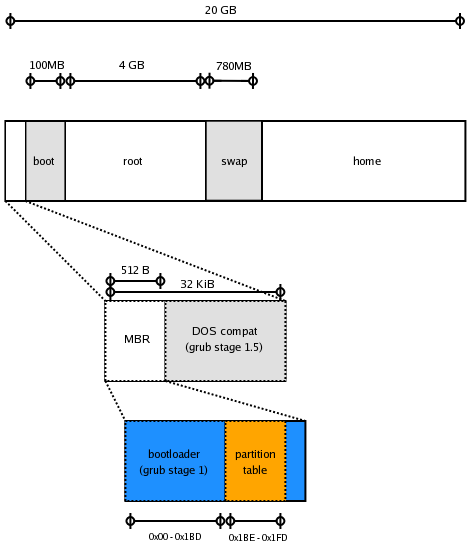 Here is a good overview of the GRUB 2 boot process which was written 5 years after I wrote the following notes. Starts executing bootloader code (boot.img). This loads the first sector of the core image (diskboot.img), whose location was stored at a particular location in boot.img at GRUB install time and usually points to the core image located in the "DOS compat space" immediately after the MBR. diskboot.img in turn loads and executes the rest of the core image. normal.mod loads the grub.cfg file and executes the statements, usually providing a menu to the user etc. This is a more flexible mechanism. For example one can prepend pxeboot.img to the core image instead of diskboot.img. This will then load the whole core image from the network and then start executing kernel.img.